TMNT Entity: The Ghost of 13 Mile Island! The Ghost of 13 Mile Island! At the 13 Mile Island Scientific Research Facility, a security guard has an encounter with a spooky, vaporous ghost. Panicking, he pulls the fire alarm. 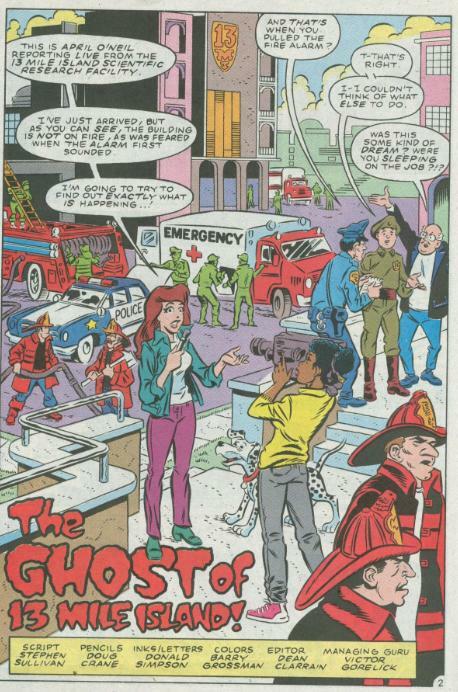 April O’Neil and her camerawoman, Linda, arrive on the scene in search of news. As April tries to interview the terrified guard, the complex’s owner, Vance Block interferes. He explains that there’s nothing mysterious going on whatsoever and, by the way, all these strange ghost sightings have absolutely nothing to do with the recent disappearance of Professor Proton. April asks Block to put his money where his mouth is and let her do an overnight investigation in the facility to prove his claims. Block agrees and tells her to come back after dark. Later that night, April shows up in her WTRL news van. Linda was unable to make the appointment, but April has some substitutes with her: four Ninja Turtles fresh from their recent Hawaiian vacation. 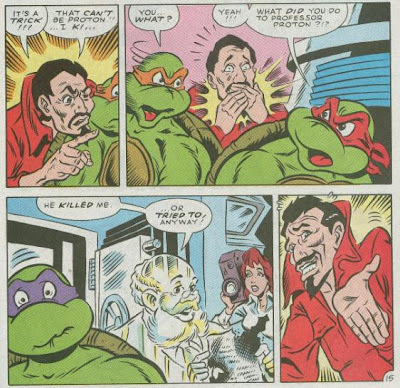 Dressed in trenchcoats and fedoras, the Turtles join April in the building where they’re met by Jay G. Paul, the assistant of the MIA Professor Proton. Paul gives them the tour of the heavily guarded and carefully monitored facility. He shows them that there are cameras everywhere, save the labs, as those are privately rented. Regardless, there’s no way Proton could have left the building without being seen. Paul laments that without Proton’s genius, he has been unable to recreate the man’s fusion experiments and that soon their financers will have to abandon the project. As Paul goes back to the lab to finish up some work, April and the Turtles split up to search for clues. Don is briefly accosted by the amorphous blob of a ghost, but it quickly disappears. Reappearing by a balcony, Mike spots the specter and attempts to tackle it. He passes right through the phantom, nailing Raph by mistake. The two Turtles go tumbling off the balcony and scramble before a guard spots them. Elsewhere, the ghost appears before Leo and leads him down a corridor. 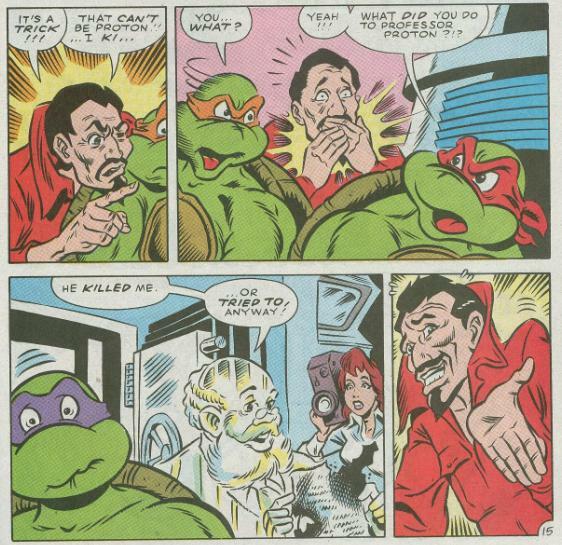 Grabbing April, all four Turtles get together and chase the ghost back toward Professor Proton’s old lab. As it happens, Jay Paul is actually Jay Paulson, an employee of Paulson Petroleum. The Petroleum people didn’t care for Professor Proton’s experiments in limitless energy through fusion, so they sent Paul as a spy and, eventually, assassin. While testing Proton’s new fusion force cannon, Paul took the opportunity and blasted the Professor with it; disintegrating him. Proton found himself trapped in the other dimension and began trying to communicate with people in the facility, but they could only see him as a shapeless “ghost”. Not about to go to jail, Paul tries to blast the Turtles and April with the force cannon, but Proton blocks the ray. The Turtles then beat Paul up and toss him in the safe until the authorities arrive. 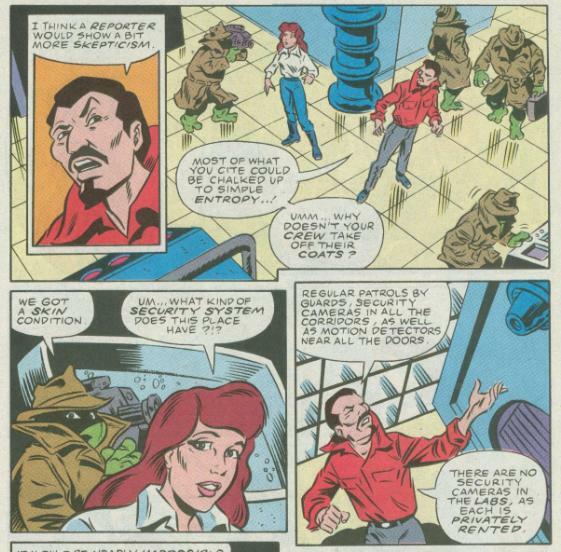 As April explains everything to Vance Block, the Turtles call in their friend Carol Sagan to see if she can’t restore Proton to this dimension. Sagan is doubtful, as Paul destroyed all the force cannon’s notes; it may take decades to recreate the device (which shorted out when Proton blocked the blast from hitting the Turtles). Proton is in no rush, as while he’s stuck in that dimension he’s essentially immortal. And with no need for money, he offers to treat the Turtles to dinner. Michaelangelo suggests… Chinese! *This story is continued from “The Wrath of the Fire God”. *Linda will appear again in April O’Neil #1. While there’s definitely some villainizing of Big Oil, it isn’t as overbearing as other messages you’ll find in most environmentally conscious TMNT Adventures stories from this era. “The Ghost of 13 Mile Island” is really just a faux “Scooby-Doo” kind of tale and there’s nothing wrong with that. This story takes all its cues from the aforementioned Hanna Barbera cartoon. There are a few red herrings pitched in for good measure, but the true culprit is never in doubt (with the red shirt and goatee, Paul might as well be dressed like The Devil). So it’s not much of a “mystery”, just an excuse for the Turtles to run around a spooky joint at night, chasing a phony ghost. Again, real “Scooby-Doo”. The artist, Doug Crane, isn’t one I’m too familiar with and I don’t think he drew a lot of TMNT Adventures issues. Judging by his character models for many of the incidental human characters (Block, in particular), I wouldn’t be surprised if he worked most prominently on the main Archie title. His work isn’t too extravagant, but he does the job well and adds a lot of nice touches to the rooms of the facility; some great little details here and there. Kind of hard to judge him as an action artist, since there really isn’t a whole lot of fighting in this story. If there’s anything about these first two TMNT Adventures Specials as a whole that I like, I suppose it’s that all four stories flow from one to the other, forming their own story arc. I had originally taken them for just a bunch of random one-shots, so I was pleased to see that they call back to one another and form a consistent narrative. While the first few stories (those published in the previous special) are pretty insipid, they do improve with each installment and the ones published in this second special are mostly pretty good. Nothing great or spellbinding, but some okay Turtle stories for what they’re worth.